The user-submitted article "What's Up With Faustina's Divine Mercy Devotion (2)? Another Approach For Getting To The Truth" is now available in Kindle & paperback formats. MCS Newsflash: New Releases! Four Great Inspirational Catholic Coloring Books Are Now Available! We're happy to announce that we've released the following great new inspirational Catholic coloring books which "provide hours of wholesome recreation - and are so much better for your soul than television!" Book 3: "God Loves You: Inspirational Coloring Book for Adults With Quotes From the Saints (Vol. 3) - 50+ Simple Floral Coloring Images With Uplifting Quotes From Saints For Inspiration, Art Therapy, Stress Relief, and Relaxation"
Book 4: "Snowflake Meditations: Inspirational Coloring Book For Adults With Meditation Topics - 50+ Beautiful Snowflake Coloring Images With Meditation Topics For Inspiration, Art Therapy, Stress Relief & Relaxation"
Visit MyCatholicSource.com/Media for more details. MCS Newsflash: New Release! "Coloring Book For Catholics: 50+ Latin Prayers (Beginning-Intermediate-Advanced)" is Now Available in Paperback! "Coloring Book For Catholics: 50+ Latin Prayers" - "A fun way to become more familiar with Latin prayers & increase Latin language retention!" - the second book in our Catholic Educational Series & first MyCatholicSource.com Activity Book, is now available in paperback! With beginning to intermediate to advanced levels, it's "great for the whole family!" Get your copy today. Visit MyCatholicSource.com/Media for more details. MCS Newsflash: New Release! "Setting The Record Straight About Luther: Important Things Catholics Should Know About The 'Reformer'" is Now Available in Kindle & Paperback Formats! "Setting The Record Straight About Luther: Important Things Catholics Should Know About The 'Reformer'", the first book in our Catholic Apologetics Series, is now available in Kindle & paperback formats! Don't miss this 'eye-opening' treatise concerning Martin Luther, the catalyst/leader of the 'Reformation' (a.k.a. Protestant Rebellion). Visit MyCatholicSource.com/Media for more details. MCS Newsflash: More MyCatholicSource.com Article Reprints Now Available in Paperback & Kindle Book Formats! Additional MyCatholicSource.com Article Reprints Are Now Available in Kindle & Paperback Formats - See Catholic Controversy Series, Book #4: "Catholics And Ecumenism". This important publication also includes a number of special bonuses! Visit MyCatholicSource.com/Media for more details. The online signup sheet for our Tenth Annual Rosary Week is now ready. Please sign up today at www.MyCatholicSource.com/RosaryWeek. For more information concerning Rosary Week, please click here. MCS Newsflash: New Release! '700+ Consoling Thoughts From Holy Scripture' is Now Available in Kindle & Paperback Formats! '700+ Consoling Thoughts From Holy Scripture: Biblical Consolation, Comforting Words, Positive Thoughts & Encouragement for Catholics in Times of Sadness, Sorrow, Grief, Illness, Trial, Persecution, or Any Time', the third book in our Catholic Devotional Series, is now available in Kindle & paperback formats! We hope you will find this pleasant & uplifting publication - which is 'filled with biblical comfort for faithful Catholics' - to be both encouraging & inspiring. Visit MyCatholicSource.com/Media for more details. MCS Newsflash: New Release! 'Traditional Saint Names For Catholics' is Now Available in Kindle & Paperback Formats! 'Traditional Saint Names For Catholics - Great Christian Names for Babies, Baptism & Confirmation From the Pre-1970 Roman Martyrology, Plus Two Bonuses: 1,000+ Patron Saints & Liturgical Feasts (Jan.-Dec.)', the first book in our Catholic Reference Series, is now available in Kindle & paperback formats! Don't miss this "ultimate reference for traditional Catholic names!" Visit MyCatholicSource.com/Media for more details. MCS Newsflash: New Release! 'The iStations Book - Stations of the Cross' Based on Our 'Best Selling' Way of the Cross App is Now Available in Kindle & Full-Color Paperback Formats! 'The iStations Book - Stations of the Cross', the second book in our Catholic Devotional Series, is now available in Kindle & full-color paperback formats! Don't miss this convenient devotional aid which is based on our 'best selling' app. This publication features beautiful images, TWO traditional Way of the Cross methods, including a Franciscan method, and selected prayers in English & Latin. Visit MyCatholicSource.com/Media for more details. MCS Newsflash: New Release! 'Catholic Annual Prayer Book' is Now Available in Kindle Format! 'Catholic Annual Prayer Book', the first book in our Catholic Devotional Series, is now available in Kindle format! Don't miss this 'valuable prayer resource'! Visit MyCatholicSource.com/Media for more details. MCS Newsflash: New Release! 'Catholic Bible Facts' is Now Available in Paperback & Kindle Book Formats! 'Catholic Bible Facts', the first book in our Catholic Educational Series, is now available in paperback and Kindle formats! Don't miss this handy, information-filled resource! Visit MyCatholicSource.com/Media for more details. These two new MyCatholicSource.com article reprints are now available in Kindle & paperback formats: "The Traditional Latin ('Tridentine') Mass vs. the New (Novus Ordo) Mass" Plus Companion Article: "'Tridentine' Vs. Novus Ordo: Some Pictorial Comparisons". Visit MyCatholicSource.com/Media for more details. MCS Newsflash: MyCatholicSource.com Article Reprints Now Available in Paperback & Kindle Book Formats! These two new MyCatholicSource.com article reprints are now available in Kindle & paperback formats: "Summary of Changes Since Vatican II: A Revolution in the Church?" Plus companion article: "Vatican II and its Fruits". Visit MyCatholicSource.com/Media for more details. MCS Newsflash: User-Submitted Article Now Available in Paperback & Kindle Book Formats! An 'eye opening' MyCatholicSource.com user-submitted article concerning Faustina's Divine Mercy devotion is now available in paperback and Kindle formats. Visit MyCatholicSource.com/Media for more details. MCS Newsflash: Sign Up Today For Our Ninth Annual Rosary Week! The online signup sheet for our Ninth Annual Rosary Week is now ready. Please sign up today at www.MyCatholicSource.com/RosaryWeek. For more information concerning Rosary Week, please click here. MCS Newsflash: New Apps Released! Two iOS versions of our latest app - My Crucifix & My Crucifix for iPad® - are now available for sale! MCS Newsflash: Sign Up Today For Our Eighth Annual Rosary Week! The online signup sheet for our Eighth Annual Rosary Week is now ready. Please sign up today at www.MyCatholicSource.com/RosaryWeek. For more information concerning Rosary Week, please click here. SPECIAL FEATURE - Amoris Laetitia: License to Sin & Profane? The Special Feature article entitled 'Amoris Laetitia: License to Sin & Profane?' (concerning Pope Francis' Post-Synodal Apostolic Exhortation) is now available here. The Android version of our Saints4U app is now available for sale! A new guest article has been added to the site ("American Catholic Lawyers Association, Inc. Press Release on Obergefell v. Hodges"). To view, please click here. MCS Newsflash: New App Released! 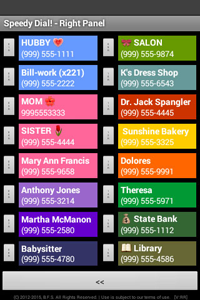 The Android version of our Speedy Dial! app is now available for sale! MCS Newsflash: Sign Up Today For Our Seventh Annual Rosary Week! The online signup sheet for our Seventh Annual Rosary Week is now ready. Please sign up today at www.MyCatholicSource.com/RosaryWeek. For more information concerning Rosary Week, please click here. The long-awaited Android version of our Catholic Bible References app is now available for sale! We have just been notified by our host of a "Network Component Upgrade" that may result in "brief periods of potential network connectivity instability" from 02/05/15 22:00 CST through 02/06/15 03:00 CST. Our host indicates that they will be "upgrading the network hardware that [our] server relies on" in order to "bring greater stability, redundancy and speed to [their] network." According to our host, this scheduled network maintenance may cause our site to be unavailable for "short periods of less than 3 minutes" during this 5 hour period. We regret any inconvenience this may cause our visitors. While the feast days have been added to the (Novus Ordo) calendar, they are "optional and not obligatory memorials." MCS Newsflash: Guest Article - What's Up With The Recent Papal Canonizations? A new guest article entitled "What's Up With The Recent Papal Canonizations?" has been added to the site. It covers various 'reasons for concern' regarding the recent papal canonizations and also discusses whether or not canonizations are infallible. To view, please click here. MCS Newsflash: Sign Up Today For Our Sixth Annual Rosary Week! The online signup sheet for our Sixth Annual Rosary Week is now ready. Please sign up today at www.MyCatholicSource.com/RosaryWeek. For more information concerning Rosary Week, please click here. Our host has once again experienced a major outage that has affected our server. They are once again unable to provide an estimated time for repair, but they assure us that they are working on the problem. Please note that the outage is NOT related to our site redesign efforts - the issue resides with the hosting company and it is TOTALLY UNRELATED to our site (many other servers are also down). We hope our site will be up again soon. In the meantime, we regret any inconvenience to our visitors. Thank you for your patience. We wish you God's blessings. Our host has experienced another major outage that has affected our server. According to a telephone support agent, it is due to a network outage at their datacenter. They are presently unable to give us an estimated time for repair. Unfortunately, we need to stick with our present host for the time being for various reasons (e.g. amount of time required to change, expenses involved in change, increased costs of the change in the future, possible compatibility issues while our site is undergoing redesign, etc. ), despite the degraded service we've received since we were forced to switch servers after their acquisition. We sincerely regret the accessibly issues and hope they will be resolved soon. Any prayers you might be able to offer would be greatly appreciated. God bless you. 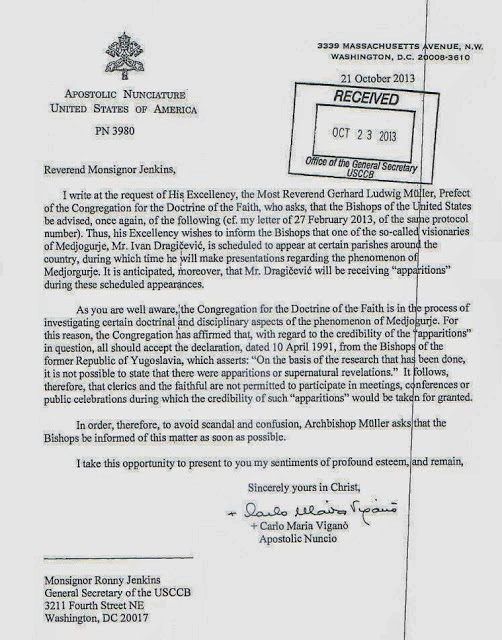 NEWSFLASH: Apostolic Nuncio Reminds USCCB General Secretary that clerics and the faithful are "not permitted to participate" in events during which the alleged 'apparitions' at Medjugorje are "taken for granted"
A recent letter to the General Secretary of the USCCB has been made public in which the Apostolic Nuncio, writing at the request of the Prefect of the Congregation for the Doctrine of the Faith, reminds that clerics AND faithful may not participate in "meetings, conferences or public celebrations during which the credibility of such 'apparitions [at Medjugorje]' would be taken for granted." The CDF is still investigating aspects of the alleged apparitions, which are controversial for a number of reasons (including frequency of alleged apparitions, promised healings & signs which never materialized, 'road show' apparitions, money-making aspects, contradictions/lies, disobedience, troubling messages, etc.). Past examinations of the alleged apparitions have found nothing of a supernatural origin. Related: Marian Apparitions at Medjugorje: True or False? Visit the MCS Daily Digest!